Measurements: 1/4" wide at the sapphire tapering to just under 1/8" wide at the back. 5/16" profile. With this incredible design, we've taken what could have been a simple and understated look and dialed it up a few notches with the incredible detail seen in the gallery and sides of the ring. But it all starts with an amazing, rich cornflower blue sapphire at the center that will truly catch your eye. The color intensity is striking and we guarantee that you will receive many compliments on this breathtaking ring. The sapphire is held by diamond studded prongs which are finished with milgrain edging. The diamonds in the band and optional matching band are also bordered in milgrain edging. No matter the angle from which the ring is viewed, the detail will most definitely be noticed. 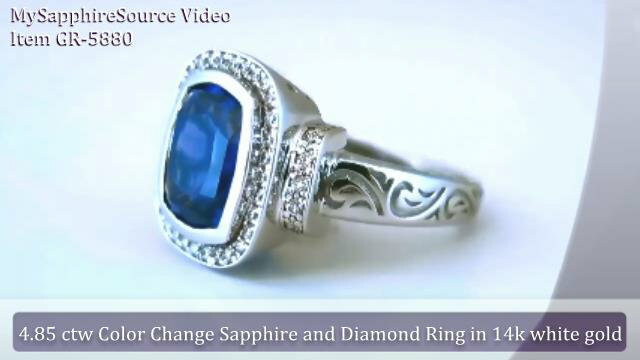 The diamonds are of very fine quality and just dazzle and sparkle and bring out the liveliness in the sapphire as well. The craftsmanship of this ring will be readily evident when you see this ring in person. We definitely think you will find yourself regularly admiring this ring on your finger! A matching band is available for this ring. See item SSR-100256. We will be making this ring for you in the ring size that you select. You can choose your ring size in the ring size selection drop-down menu above. You will notice that there is a "Stock Size" defaulted which is fully refundable. For all other sizes, a certain amount does becomes non-refundable. Please note that this ring does qualify for the one-time free sizing in 30 days if you order the Stock Size. This way you can purchase the ring in the stock size without risk, and if you decide that you love the ring and wish to keep it, you can return it to us within 30 days for free sizing and free return shipping (US only).